Cheval Residences is like Louis Vuitton, elegant and timeless. Discover the best of London with us. This November, Louis Vuitton will launch the 15th edition of its city guides, each of which invites readers to explore one of the world’s top destinations through insider tips and recommendations. Since 1998, Louis Vuitton has been sharing its insatiable urban wanderlust through its City Guides. Eagerly awaited every year they truly capture the heart and spirit of each city explored, offering a hand-picked selection of exceptional places, delivered with flair and conviction. This year, the collection embarks on a new journey, taking in fifteen of the world’s most exciting cities across all its inhabited continents: Beijing, Cape Town, Hong Kong, London, Los Angeles, Mexico City, Miami, Moscow, New York, Paris, São Paulo, Seoul, Sydney, Tokyo and Venice. In keeping with the reputation of the Louis Vuitton brand, the listings in each guide are chosen by travelers with high standards and a taste for luxury. The guides benefit from the wide-ranging contributions of a team of journalists and authors from different countries and backgrounds. Never shying away from subjectivity, these fiercely independent contributors may purposely avoid the usual expected places and reveal others off the beaten track, always articulating their own personal vision, taking in everything from the most exquisite hotels to the very best chocolate shops, from neighborhood eateries to elegant luxury boutiques, from electro dance clubs to little-known museums. The city guides are written in an open and subjective tone meant to immerse readers in the city’s history and atmosphere, and to urge both first-time visitors and inhabitants of the city to explore a new side of their home town. Each city guide also features tips from a local celebrity, such as South Korean actor Lee Byung-Hun for Seoul or Lourdes Lopez, director of the Miami City Ballet. Louis Vuitton invited the French photographer’s collective Tendance Floue to illustrate the guides with photos that convey the mood and soul of each destination. Each guide is available individually at £26. 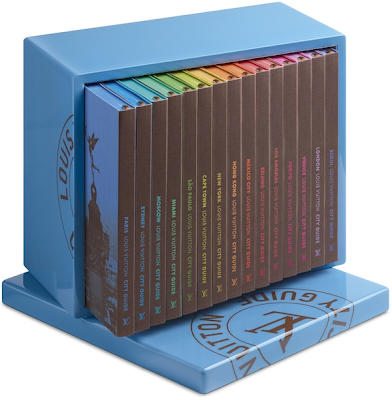 For the avid world traveler, the brand also offers a limited edition lacquered wooden box containing all 15 city guides at the price of £385. Here you can see the video of London travel guide, a Gentleman's Requisites (even if you are a Lady, you should watch it, is really cool).